Maria Cooper introduces the newest Transition Network publication: A Guide to doing Transition in your University or College, published today. And perhaps most importantly, and what I certainly didn’t feel I got from my university course: How to take care of myself and deal with the overwhelm and confusion anyone can feel when trying to discover how to have a future in a world with climate change, vast ecological change, economic collapses, consumerism on steroids, wars, terrorism, Trump, Brexit and all the rest of it. With the very transient nature of university life, with people seemingly constantly arriving and leaving, the Transition group gave me a good grounding and sense of place. Through it I felt more connected to the town and the nature that was hosting me during my university years, and helped to put academic studies into context. As the years passed by and I got deeper into the Transition group, I discovered so many more reasons to be involved and pursue our very own special transition in the university. First of all, I’m thrilled by the social change that our very practical projects were having. I found myself in a community garden digging potatoes with my lecturers and the head of Estates/Facilities management, which drastically changed how we related to each other and each other’s functions within the university structure. Friendships started breaking down the traditional hierarchies in academic environments, not so surprisingly to the benefit of everybody’s work and tasks. And it was just so much more fun and meaningful to step out of the siloed approach to university life. 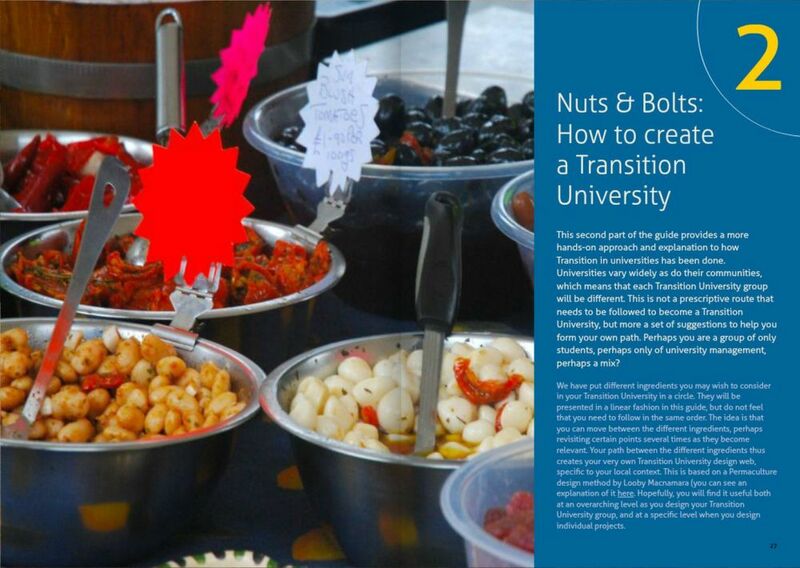 I also love that Transition embraces such a holistic approach, achieving change on a systemic level in the university. These are powerful institutions, often owning a lot of land, and having a huge footprint on their local area in terms of consumption, energy, and travel. If we can get a change through the institutions, such as introducing a biodiversity plan, or energy efficiency measures, the scope for impact is so much higher and tangible than if we were to go and try to do it one private home at a time. But what makes me most excited is that so many people pass through a university. And universities are such great learning environments, incubators for (behaviour) change, and experimentation sites. Many people who are there are looking for new ideas, new ways of living life, and are open to engaging with Transition. If there is anywhere we can reach a large chunk of the population and spread ideas about how to design our future, it’s through universities. 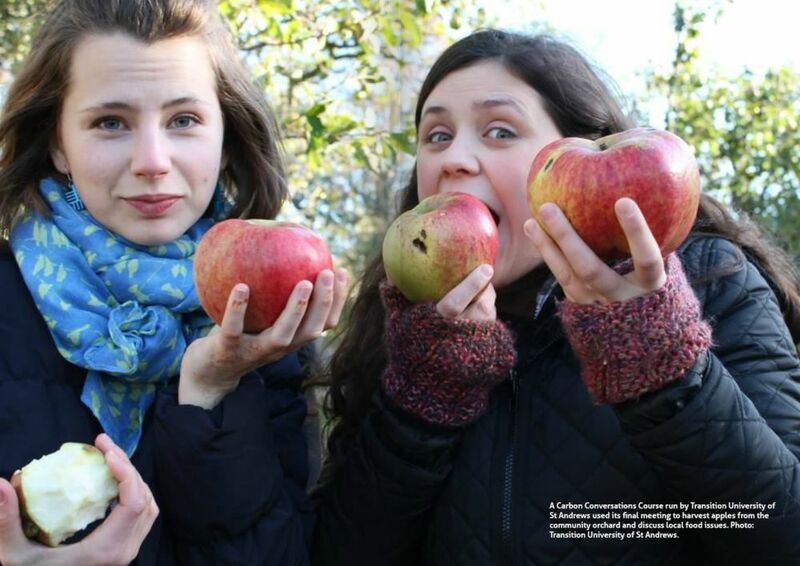 All of these students, lecturers, visiting doctorates, staff members, who spend a few years and then move on, they can all be inoculated with little seeds of sustainability. 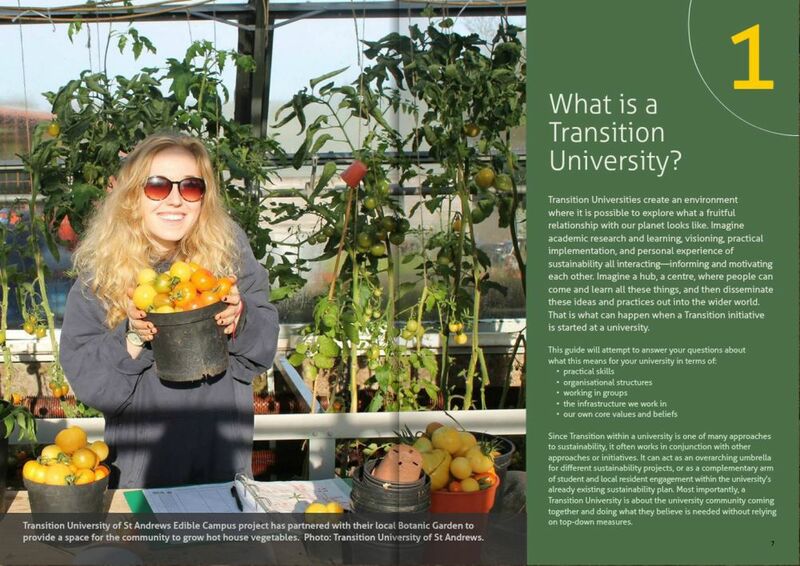 We see our Transition alumni as taking Transition with them to wherever next they go in the world, and perhaps a new Transition group (or something similar) sprouts soon. In fact, many of my friends from our Transition university group have gone on to have what I can only describe as Transitioned careers. Once I had graduated from my course of International Relations (but really, from the Transition University), I realised that perhaps there was something in that experience that was worth sharing. "Universities are such great learning environments, incubators for (behaviour) change, and experimentation sites. Many people who are there are looking for new ideas, new ways of living life, and are open to engaging with Transition". I travelled around to some other Transition Universities in Scotland and talked to them about their initiatives, how they worked, highpoints and lowpoints, opportunities and challenges. The result is what we are launching today, the very first version of how to do Transition in Universities and Colleges, which is a collection of examples of how Transition has been done in the universities I visited. As with all Transition groups, there is no one right way to do it, each university and college will have its own unique characteristics and appropriate solutions. So this guide is offered as suggestions and inspiration. We have a dream to use it as a base and develop workshops to take out to other universities in the future (keep your eyes open for that!). But for now, please read it, find what speaks to you, and run with it. I do hope you enjoy it! 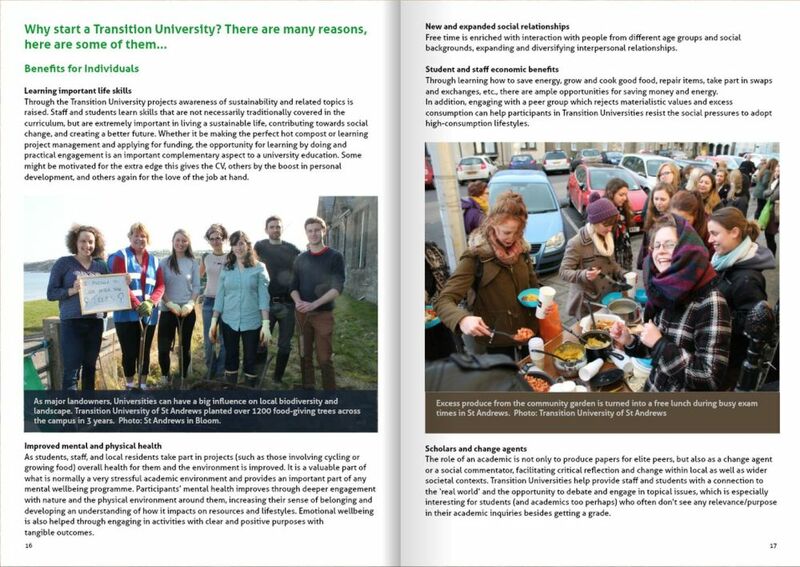 Oh, and Transition University of St Andrews is still going strong – you can see their website here. A first workshop to explore how the guide can be used in practice will be held on April 7th in Dundee. For more information contact Maria coop.maria@gmail.com. This is brilliant! I am sharing this with my students and with colleagues at other universities here in the U.S. Great work, Maria! ENSEIGNEMENT | De l’éducation au développement durable... - Jump, le blog ! Coming Soon! The First Transition Network Roadshow – St. Andrews!